Photo above, Geoff West looking on, with Irv Kalb to left. We’re in a fortunate position that many of the people who stood on the pitch, or rather car park, for the first ever game of ultimate frisbee are still alive, and willing to share their memories of that day and the decades that followed. Geoff West is one of those original enthusiasts, here are his insights into how they began and grew the game now played so widely across the world. There are several Johnny Appleseeds in the CHS reunion pickup shot. Back row from right end is Joe Barbanel and his crazy head of hair! 4th from the right is Dave Dinerman and to his right in dark blue is Ed Summers. To Geoff’s right kneeling is Larry Schindel. Next to him are several of that year’s CHS Women’s team, Sparkle Motion that scrimmaged with them that day. 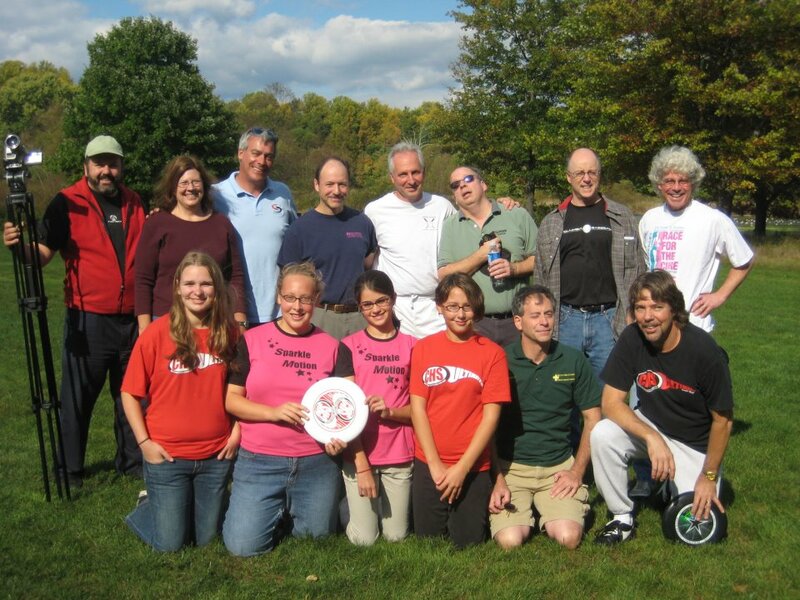 You were at Columbia where Ultimate first originated before going to Rutgers. So did many of the other guys from the time at Columbia go on to start up teams at the different colleges they went to? Every CHS (Columbia High School) grad on the “Johnny Appleseed” list started a college team. In fact, that first year or two, almost every team that formed was due to the exporting of CHS talent. Geoff playing D, last year during weekly pickup games, guarding his son’s friend, Gino, who organized games. Is Joel Silver fed up of everyone asking him about Ultimate? How long did you play for / do you still play? I saw a photo of you that suggested you might still play the odd time? After Rutgers, I became the unofficial CHS coach for a few years until marrying and relocating to AZ in late ‘80. Out here, I fell in with the Thunderbird Graduate School team around ’83 and scrimmaged pretty regularly with them for the next 10-12 years. As our three boys were growing up, I ran Ultimate training sessions for each of their Fifth grade Phys Ed classes. A compound femur fracture in ’02 slowed me down, a bit, and it wasn’t until I started playing Ultimate every week with my 23 yo son and his friends back in ‘12 that I started to get back a reasonable running stride. We had a really fun Rutgers Alumni Reunion game in ’09 during which I made good on my threat to score with one of those “out-dated” overhand wrist flips…but my athletics were lackluster, at best. I just had rotator cuff surgery Nov 25 and expect my Physical Therapy regimen to have me back on the field within 2-3 months. 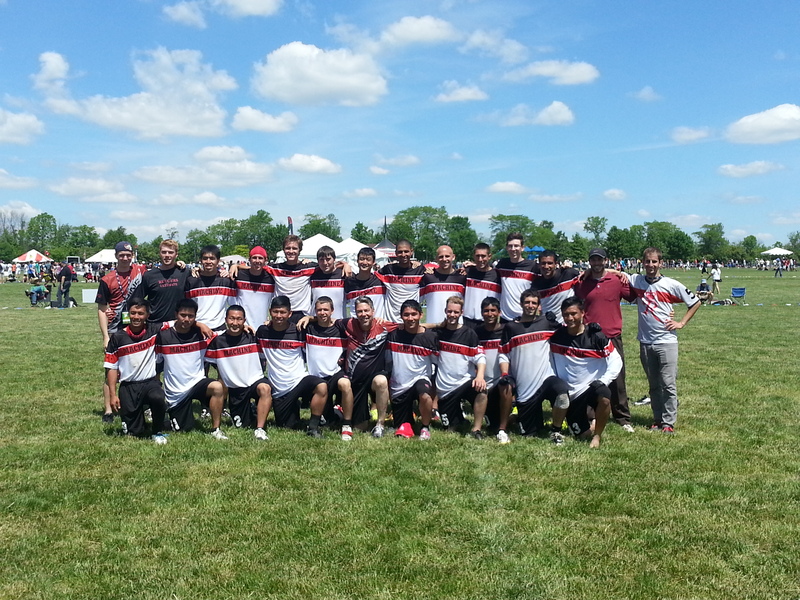 My boys on the Rutgers squad from this year’s Collegiate Nationals in Cincinatti, Ohio. Is the way that Ultimate is played now significantly different from how it was in the early 70’s? Obviously the presence of observers (and refs in the pros) but comforting that they can always be overruled by players on the field. I’ve given up even pretending I understand how the timing of games works, nowadays, and I really appreciated having willing Rutgers actives to clarify play stoppages/infractions for me at the 2014 National Collegiate Championships last summer. Strategically, there are countless refinements and resultant terminologies that I’m only currently beginning to pick up given my years away from competitive play. I’m wondering about tactics, in mentions you played zone defense back then too, so maybe they were there from the beginning? We utilized zone defense even back at CHS if man-to-man wasn’t working. At Rutgers, I often called zone because it comported better with my smoker’s lungs. I could fly like the wind for a long floater in the end zone…but I wasn’t going to be good for much for two to three minutes afterwards. Did people layout for the disc then? (Risky in car parks). Believe it or not, there were plenty of layouts at the original CHS lot, though they were generally at the sidelines. (Not a problem on the grassy, RR embankment side, a little sketchier on the downhill side into the brook. It was an unforgiving hazard that punished many victims, myself included.) Away games in HS were always on fields and our reckless abandon reflected that added cushion. The match write up talks about Dan ‘Stork’ Roddick, scoring a lot of deep points, so was hucking it long also a popular option back them also? Are games significantly longer now compared to what you played? They seem to be due to the increased stoppages in play. What age do you think the body can sustain playing ultimate too? I’ve played since ’91, & my knees ain’t so viable any more? I can’t address that from the perspective of a long term participant, though I’ve certainly tested my muscular-skeletal system in other ways! I’m on hiatus right now for shoulder re-hab, but I’ll be back soon at sixty. If you keep the physicality level age-appropriate? I’m hoping to be playing into my eighties. NB it was fantastic for us in Ireland, when, after about 4 years we finally had enough players to enter world clubs in ’99. To expose our guys to such a range of playing styles and superior athleticism helped to light the fire for further growth in Irish Ultimate. Question, you must feel proud, pleased about how the sport has grown? Walking around College Nationals this summer (which had attendance of about 20,000) was mind-boggling. (As was attending my first pro game in Jersey a month earlier.) We always knew the game was worthy of limitless growth, but none of us ever envisioned what it would look like realized. World Games and…soon? The Olympics? Again, we knew it would happen, but it’s still a little unreal that it’s all occurring. My greatest source of pride, though, is the incredible things taking place with Ultimate Peace in Israel. More than any other sport or activity in the world, Ultimate is planting the seeds of peace in one of the most fractious regions on the planet. How cool is that? Hindsight. What things did you do that you think helped the sport to grow? First and most important is the love that players quickly develop for the game and that is inextricably linked to the unique playing atmosphere that comes from SOTG. Once players are bitten, they’re compelled to create ways to continue playing despite graduations and relocations. In no small part because it appeals to our better nature. Next is the disc itself. 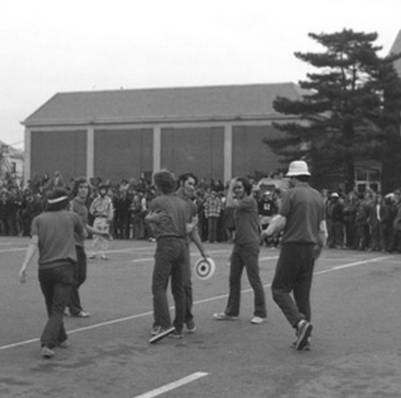 As observed in Stancil Johnson’s Frisbee Handbook of the ‘70s, “When a ball dreams, it dreams of being a Frisbee.” The sheer unpredictability of what a handler might chose to do (and the variety of tools at his/her disposal) makes Ultimate the most continuously exciting game a participant OR a spectator can be involved with. Is there anything that you think might have worked better if you had done it differently? Most assuredly I’d have gotten into the HoF sooner had I graduated Rutgers in ’76 with Irv, but that calls into question all sorts of Existential dilemmas, so we’ll stick with what happened. As far as establishing and growing the sport? I don’t think it could be scripted better! Looking forwards, what excites you about the future for Ultimate? Obviously the Olympics will be huge and I hope to see the continued growth of both the pro leagues and the increasing establishment of younger player organizations and leagues. If and when Ultimate does begin to alter the violence cycle in the Middle East, perhaps it will become a successful staple of NGO outreach efforts. Sometime within the next twenty to fifty years, (probably closer to twenty) Futbol/Soccer will overtake the NFL in popularity here in the US. It’s inevitable. The sport is reaching critical mass here and worldwide it dwarfs the NFL in participation and viewership. But the sad part is……it’ll only get five to ten years in the sun before Ultimate blows past it both here and globally. 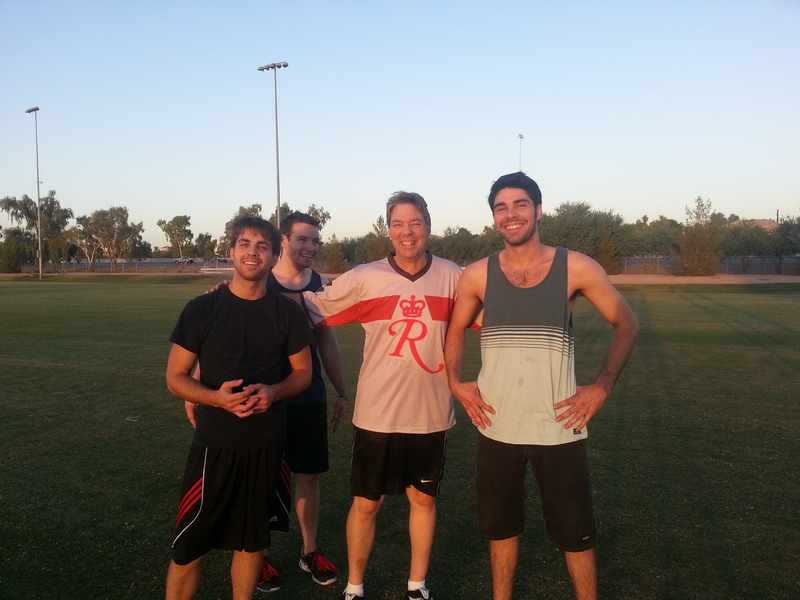 Ultimate is still growing – soccer’s done doing that except for here. Ultimate already has a worldwide foundation to build on. Come to Ireland sometime it would be great to have a game. We played the Santa Barbara Condors once in Dublin, so it’s about time we had some East coast superstars over. Though far beyond anything superstar-ish, I’ll remember the offer!